Paradoxically, the invention of the Armenian Alphabet and the precise details of this major cultural event eclipse the notion of the “beginning” of Armenian language and literature. It is often speculated that Armenian was in no way “fixed” before the creation of its own alphabet, in spite of the fact that the language was definitely spoken widely and for purposes that went far beyond ordinary communication. Gorune, the author of Life of Mashdotz, and Yeznig Goghpatsi, the scholar, historian and translator, are considered by some to be the first original writers in Armenian literature (circa 450, AD). But this consideration is true only if we define Armenian literature solely as a body of work using the Armenian alphabet. This simplistic approach obscures the real beginning since it excludes more than twenty centuries of active use of the Armenian language. This evaluation also fails to factor the clarity and the purity of the language as demonstrated through the first translation of the Bible into Armenian (circa 425). It is inconceivable that a new alphabet as well as a writing style, grammar and syntax had been created simultaneously without such an event being recorded by Gorune, Yeznig, or other historians of the era, who were directly involved in the transitional period of implementing the application of the newly created Armenian alphabet. By taking into consideration the system of declension of the nouns and the complexities of the conjugation of the verbs used in the translation of the Bible from two different languages --Greek and Syriac-- it is a high certainty that a style of writing using different characters already existed and was practiced before the invention of the Armenian alphabet at the beginning of 5th century. It is perhaps appropriate to note that the recent past of the Armenian cultural and literary evolution provides a parallel and a point of reference of how a writing style cannot be created overnight. During the final stages of the transitional period (circa 1800) from Classical Armenian (Krapar) into Modern Armenian (Ashkharhapar), it took over a century to crystallize the full development of Modern Armenian in spite of the fact that the number of scholars and/or intellectuals involved in the transitional process was by far superior to the number of linguists in fifth century Armenia, as well as the relatively superior paraphernalia of spreading a language (rate of literacy amongst the population, printing presses, newspapers, etc.). In terms of literary style and linguistic clarity one has only compare the literary output created in the early 19th century to works published at the turn of the same century to realize the gradual evolution in terms of style and development of Modern Armenian. Yet, at the beginning of 5th century, the sophistication of the writing and style of the composition that emerged immediately following the invention and implementation of the Armenian alphabet more than suggests the presence of a highly developed writing style and tradition. Today, we consider historiography and literature to be primarily secular. In fifth century Armenia, however, the adoption of Christianity was the primary source, motivation and imperative for literature. The conversion of the Armenian nation had to be fully achieved in preparation for the second coming of Christ, which was widely believed to be imminent by early Christians. While the primary task was the teaching of the new religion, the biggest obstacle to the salvation of the nation was a deeply rooted pagan past. The aggressive promulgation of Christianity demanded the erasure of that past, and such an endeavor necessitated the destruction of its records--tablets and texts as well as temples and architectural monuments. It is often asserted that the oral tradition, that of the Kousans, the itinerant troubadours or bards, salvaged a few fragments of the collective memory from the Pre-Christian era. Stories of the triumph of Haig over Bel, of the god Vahakn and the struggles of Ara the Handsome against Shamiram are only a fragment of these stories. 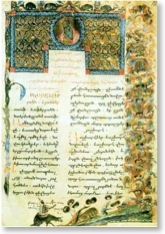 It is sometimes stated that there is no written record of pre-Christian literature in Armenia. Yet, this assumption underestimates the determination of the Armenian spiritual as well as political leadership to eradicate the non-Christian past. Sahag, the Catholigos, and Mesrob, the undisputed leader and inspiration of the movement to accelerate the transition from paganism past and present to Christianity, took an active part in deciding the course of action and decided the agenda by dictating the subjects of studies and the texts to be translated. It is reasonable to believe that this movement also included a methodical destruction of all written material that was deemed detrimental to the spiritual transformation. The exception to this dogmatic approach to Armenian culture through history and the past is Moses of Khoren. Unlike his contemporaries, for Moses, writing history was not about divine providence or preaching. Although a writer of the early Christian era and tradition, Moses recognizes the importance of the past, partially because he does not share Pavstos’s perception of paganism as an imminent threat. The scope of his monumental work, History, includes events and personalities of an Armenian past, albeit pagan. Unfortunately, we know very little about the sources of his work. 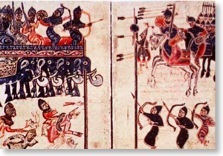 According to Moses, in fifth century Armenia, Armenians were fully aware of their identity, their geographical space, and their historical origins.The newly translated Biblical texts only confirmed some of the stories that were already known in the Armenian highland: of cataclysmic floods that resulted in the second beginning of mankind in Armenia proper that begins with Noah as the second ancestor of humanity and Mount Ararat as a point of geographical designation for the new beginning. In History, Moses narrates the story of Japeth’s grandson (through Torkom), Haig and his descendents, the Hyes (as Armenians call themselves). Although we cannot trace the sources used by Moses with full certainty, we are aware that he traveled extensively and was familiar with the works of Greek and Syriac scholars. However, a large proportion of his stories and chronology is certainly Armenian in origin. It is almost a certainty that the oral tradition provided some of the material in this remarkable work, as has the oral tradition in the early written texts of all cultures. It is undisputable that the Armenian language flourished by the adoption of Christianity and the invention of the Armenian alphabet. Yet, it is more than speculation to affirm that some literary heritage existed before the advent of Christianity and the implementation of the newly discovered alphabet. It has to be noted that the oral transmission of literary works throughout the centuries is not, of course, unique to Armenian. The entire poetry of Arabic literature known as the Age of Ignorance (predating Islam) was recorded many centuries after the Arab world had converted to Islam, and virtually all Homeric scholars accept the oral precursors of the Iliad and the Odyssey. Interestingly, in spite of an existing written culture that was largely made possible by the invention of the Armenian alphabet, in the following centuries, the oral tradition in Armenian literature continued to exist. A more recent example of this tradition may be the epic tale of Sasna Dzrer--Daredevils of Sassoun-- which had originated in the 10th century but was put in writing only in the second half of the 19th century. Language is a process of free creation; its laws and principles are fixed, but the manner in which the principles of generation are used is free and infinitely varied. Even the interpretation and uses of words involves a process of free creation.